My dad let us shoot our most recent picture in his shop on the weekends. Just after he gave us permission, he got the contract to build railing for the helical stairs which go up inside the Statue of Liberty to its crown. This was a major job, one which would have normally taken 6 months to complete. They had 6 weeks. So obviously the shop was working on the weekends, and so were we. All of us tried to share space with one another (many sound takes were ruined, we accidentally trampled over a template for the stair -- which we didn't replace exactly correctly -- eeks!). But we all got done on time. 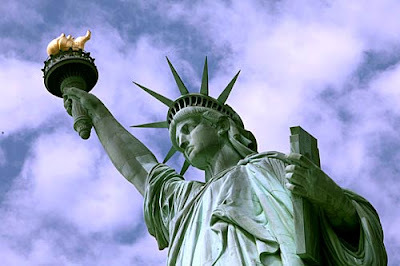 The crown of the Statue of Liberty has been closed since September 11, 2001. Today, July 4, 2009, it reopened. "The staircase is such a tight helix, and unbelievably steep - almost like a circular ladder. Getting accurate measurements is absolutely impossible. The detailers spent many long hours (at night) trying to make templates. Then the shop would fabricate a piece shaped to the best guess of the detailers. Each piece had to be trucked to the dock, loaded onto the work boat and taken to the island. It then had to be hand carried several hundred yards, passed through security and up a flight of stairs to reach the elevator. The elevator could lift only to level 5P (5th floor of the pedestal). The rails then had to be carried to level 7P. Then the hard part began - getting them up the spiral stair and trying to fit them into their proper place. When a rail didn't fit, which was frequent, the transportation process had to be reversed to get it back to the shop so as to make the corrections and repeat the trek the following day." They finished two days ago. And now the crown is open to the public. "The move was seen as part of President Obama's attempts to distance the administration from the policies of his predecessor that critics said had hardened America's image since Sept. 11. The Bush administration contended that the attacks and the deaths of hundreds of people in the collapsing World Trade Center towers underscored the potential dangers to crown visitors in the event of another attack or other emergency. "Reaching the crown involves climbing a narrow double helix staircase, with no option of turning back because of the inevitable lines of people snaking their way up. There are 146 steps in the crown climb, said Darren Boch, a National Park Service spokesman. The total steps from the statue's base, which was reopened on 2004, to the crown number 354."